bjimba's bjimblog: Bill Cosby: Say it ain't so, Cos! 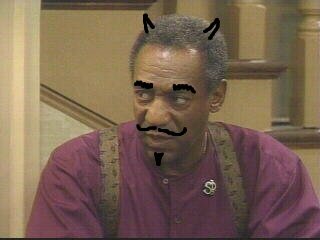 Bill Cosby: Say it ain't so, Cos! Andy Baio is a rarity -- a blogger willing to take a stand on principle, and stand up to a celebrity with too much money to pay lawyers. The celebrity in question is Bill Cosby, someone I have long enjoyed and respected. I can only hope, with diminishing expectation, that Cosby is unaware of the cease-and-desist orders being promulgated by his legal team. Here's the story. It seems that it's okay to parody Mr. Cosby if you've got the money to staff your own legal team, but independents like us can't afford the rights we thought we were guaranteed in the Constitution. In case Mr. Cosby's legal team sees this post in their scans, I only ask that they pass along the following to Bill himself: Sheldon Leonard would be ashamed of you.